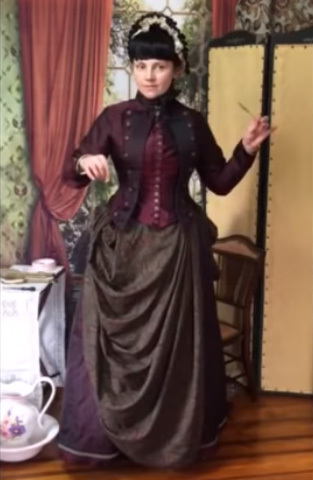 Second Bustle Era walking costume. 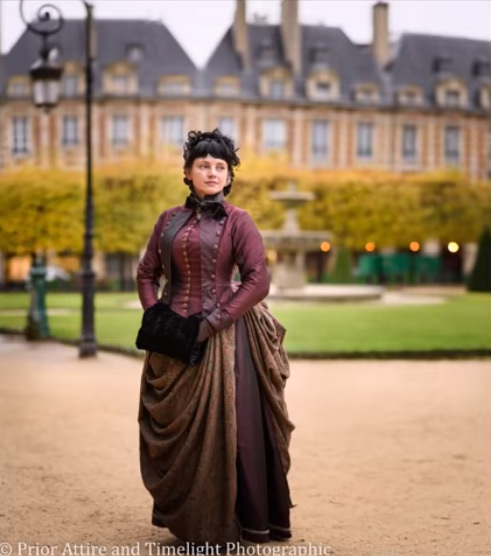 How did women dress in 1887? 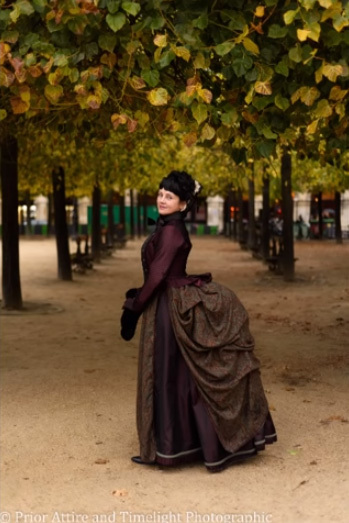 Second Bustle Era in Europe was in the late 1880s. 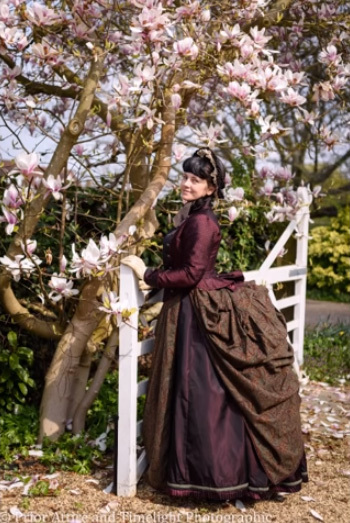 Women started to wear very stiff and large bustle cages, but the dress itself was conservative and had a few adornments. 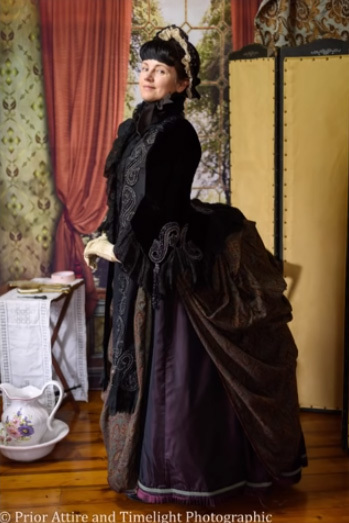 Though, the distinctive silhouette became a symbol of the end of the 19th century. 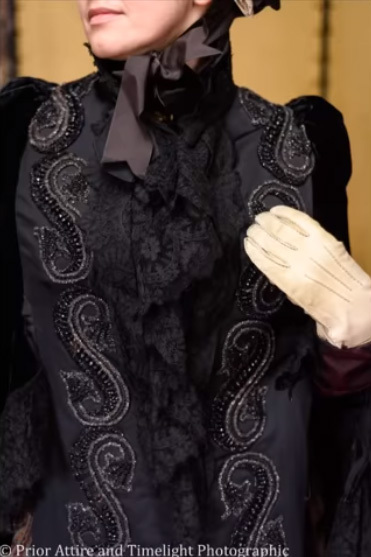 Let’s see how a female costume looked like in 1887 and what garments it included. We’ll talk about new trends in underwear, the fashionable silhouette, and trendy accessories from this period. Also, we’ll share some secrets known to women of the Second Bustle Era. 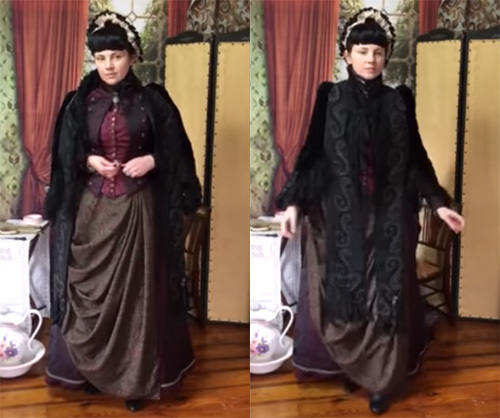 Today, we are looking at the layers forming a typical, fashionable Second Bustle era ensemble from about 1887. 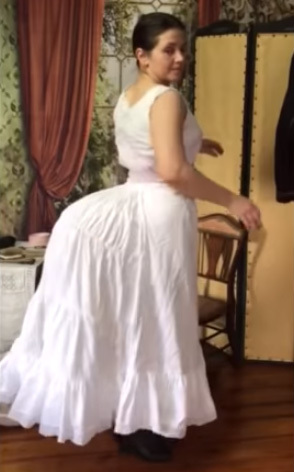 This was an era when the bustle was at its biggest – forming a bizarre, shelf-like posterior. Let’s see how to achieve the effect for a middle/upper class woman. 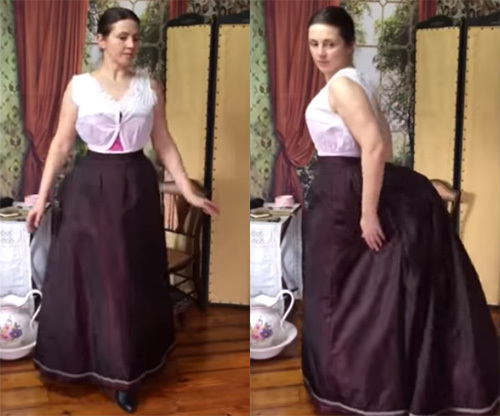 Bustle is a padded undergarment worn by women to add fullness to the gown. It was popular in the mid to late 19th century. 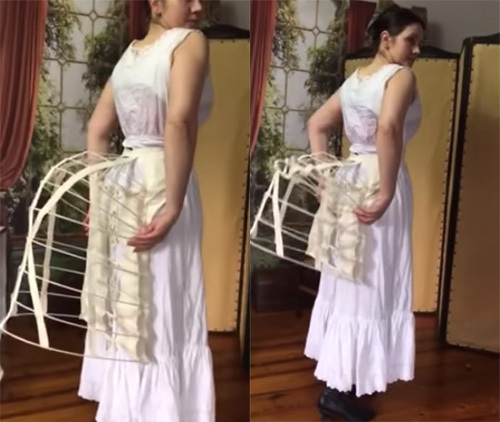 There were plenty of different designs and shapes of a bustle cage. This time, we are starting with a nightgown. Made in soft but sturdy cotton and decorated with lace, it was comfortable to sleep in. First, stockings. These have silk ribbon garters, easy to tie, easy to change. Plain ribbon or elastic one could also be used. Stockings would be changed and washed regularly, and the style would change depending on the season. Silk or cotton would be worn in warmer season, wool in winter. Combinations next. 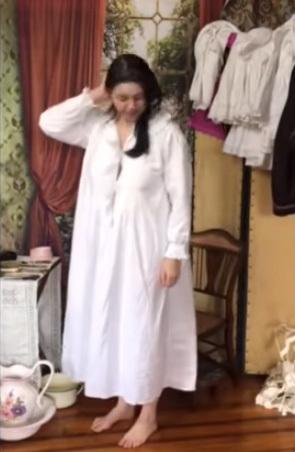 Relatively new, they combined a chemise and drawers in one garment. The legs of the garment are still open for the ease of toilet access. The garment buttons up down the front. The neckline can be regulated with a silk ribbon, too. Boots next. Though, they can also be put on at the end. The boots close up with buttons – and the button hook makes the job much easier. The buttons are mounted on the elastic, so the hook can grab them and thread through the buttonhole easily. Laced boots were also used. 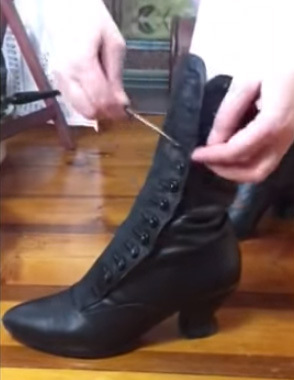 From about 1850s, boots could have an elastic insert to make the fit easier, too. Corset next. This one is in coutil and silk, with black lace, and sports a spoon busk – more support resulting in a nice, curved belly line. 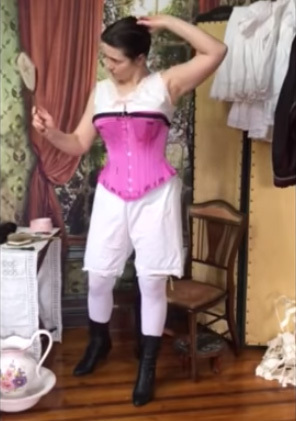 Once, corset was semi-laced. It was a good idea to have a break and let your body relax into it. Perfect time to start on the hair. The hairstyles were becoming simpler than in the previous decade, no masses of ringlets or gigantic hairpieces. For a standard day, a simple updo will do. Hair is plaited and pinned up. It will form a secure base for adding some basic hairpieces. If you had enough own hair, no hairpieces were really needed. No makeup though – powder and beauty creams were in use but anything else was frowned upon. 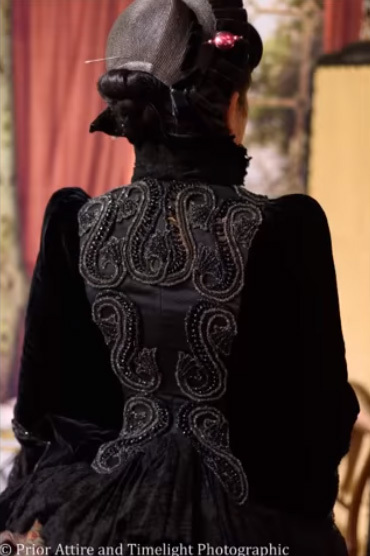 Lacing a corset was a rather simple affair: top lace regulates the upper part, and bottom lace – the lower. A maid could help here, but it was not necessary. And maids would get into their corsets unassisted. The laces are crossed over at the back and brought to the front, passed under the lacing hook, and tied. The hook keeps the laces just under the waist. Light petticoat next, though in summer, you can skip this one. We are discussing an autumn-style outfit, so this would be worn for warmth. It buttons at the side and the drawstring in the back helps to regulate waist. A standard camisole or corset cover goes on next. 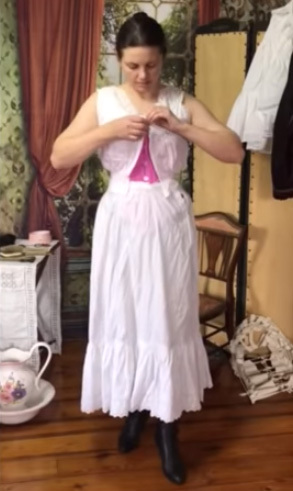 The camisole prevented the outline of the corset to be seen under the bodice and helped absorb body oils, etc. Bustle next – this amazing contraption. There was a variety of bustle cages used, fully covered by fabric or open ones. This one is made by a tape-covered steel wire and cotton tapes. Very light, very flexible, and the size can be regulated by the inside tapes. And you can sit in it comfortably. Main petticoat next. It has just one flounce at the hem but a lot of fabric at the back. The size of the back can be regulated with an inside drawstring, fitting it to different size cages. Undergarments are done. Time for the outfit proper. 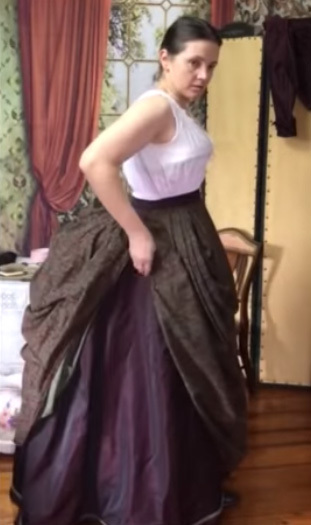 The silk and cotton skirt also has tapes at the back, helping the skirt to sit evenly over the bustle. The skirt is made in flatlined panels and hemmed with a silk ruffle and wool braid. 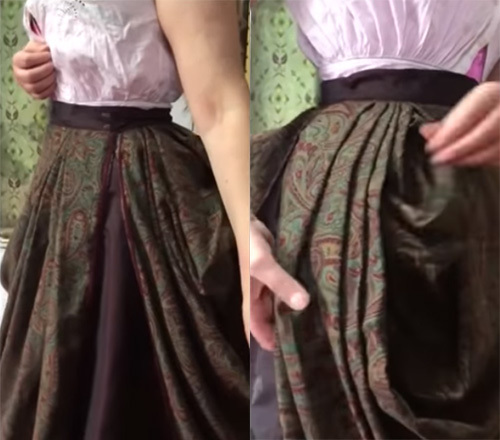 The skirts frequently had pockets – bigger ones in the seams and smaller ones (for coin or a watch) at the waistband. An overskirt drapery is next. More tapes inside to arrange the fabric. This one is made in soft wool, but a lot of styles were around, in silks, wools, cottons, etc. Sometimes as a part of the dress, sometimes separate. Detail of pleats arrangement and the fashionable Burnous pleats. The hairpieces go on before the bodice goes on. If the woman used additional hair, of course. Human or horse hair was used. The hairpiece forms a good foundation for a hat – it is also much easier (and safer) to pin your hatpins through the hairpieces. Bodice next. It is made in silk, in a fashionable style sporting a false vest and open jacket. It is boned and has a waist tape. 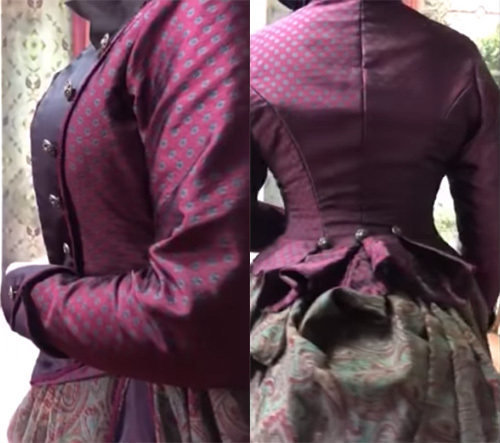 The waist tape hooks first – it takes the strain from the buttons. This style could also be achieved with a blouse, a waistcoat, and an open jacket. Although more versatile, that would mean 3 layers instead of 1. Still, not a bad thing on a warm day if you want to remove the jacket. Let us add a nice brooch. Collar can also button up all the way up. Hat is next. All the hair in the back fills the crown nicely, and then the ties are secured under the chin. The hat is also secured with hatpins, which could be a convenient weapon, by the way. Hatpin length was restricted in the beginning of the 20th century to make it safer… for the men who would be on the receiving end of the pin. And if it is a cool day, a mantle, dolman, or cloak would be worn, too. This is an antique dolman, in velvet and silk, with superb beading. 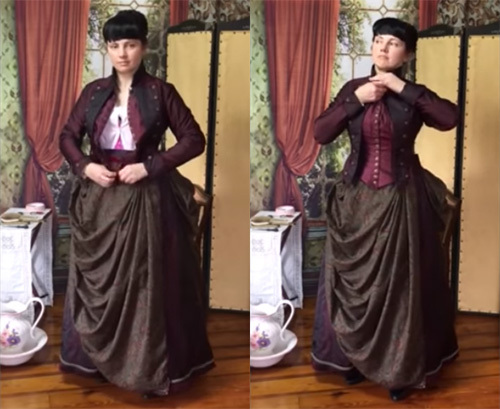 It has a waiststay to ensure that the back lies flat and close to the bodice. And it closes in front with hooks and eyes. Gloves, parasol, and the woman is ready. Close up of the dolman. The whole process, from the nightgown to the end, usually takes about 8-15 minutes at most.